The chart and table below show the number of rockets fired at Israel from Gaza each month in the period 2002 to January 2010. The data source is the Intelligence and Terrorism Information Center at the Israel Intelligence Heritage & Commemoration Center (IICC). The IICC data is apparently the official Israeli count as it is referred to by the Israeli Ministry of Foreign Affairs on its website. Links to specific documents from which the data was collected: Rocket threat from the Gaza Strip, 2000-2007, Anti-Israeli Terrrorism in 2007 and its Trends in 2008, Summary of rocket fire and mortar shelling in 2008, Operation Cast Lead – Update No. 15, Operation Cast Lead – Update No. 18, News of Terrorism and the Israeli-Palestinian Conflict July 14-21, 2009. All documents were retrieved 24-July-2009. 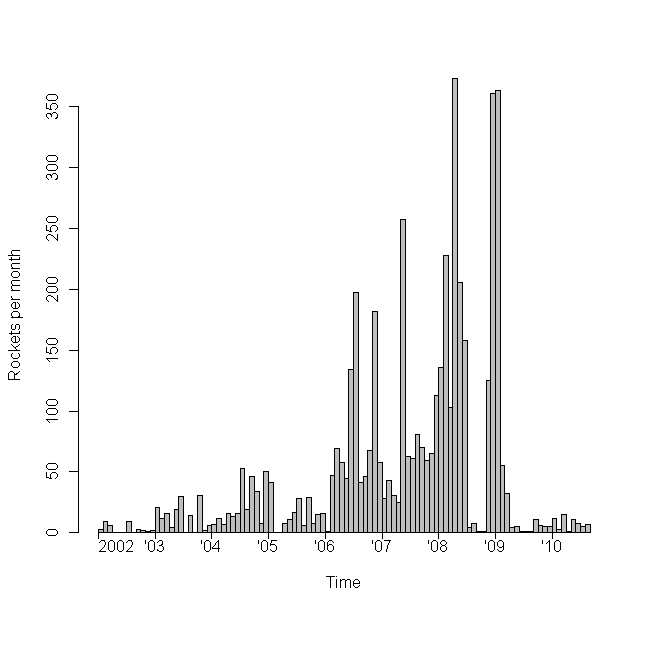 Data for most of 2009 is available by week and was assigned to months based on greatest week/month overlap. Unfortunately, no statistics of Israeli artillery fired at Gaza seem to be available. Updates: Table and graph updated to show data for later periods. All updates use data from periodic reports at the ITIC website. Note: there are often some discrepancies between the weekly and the monthly numbers of the ITIC. 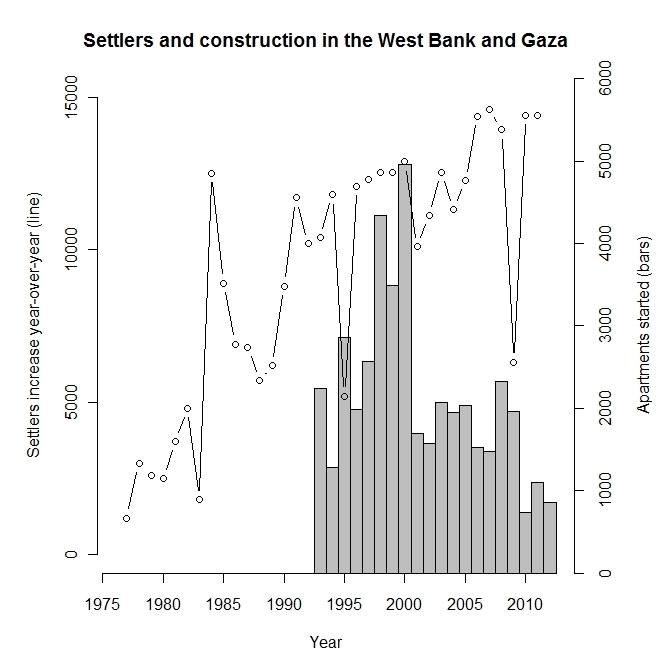 The following chart was generated using B’Tselem data. The data does not cover December 2008. The number of Israeli deaths was higher than the number of Palestinian death on the same month once during 99 months covered (June, 2001).